What makes Smooth Jazz so saxy? Female Sax players like Pamela Williams, Candy Dulfer, Mindi Abair, Ada Rovatti, Jessy J are quickly coming in my mind. Now we can add a new name. Lynn Riley just released her debut album Too Cool (2008). Lynn is joined by Rubin Edwards, who plays all sort of bass on the album and also contributes most of the compositions and arrangements. Further musicians are Kim Smith (vocals), Donna Bostock (percussion), Alex Bouno (electric Guitar), Staci Dickerson (vocals), Blaine Bostock and Russ Ferrara (acoustic guitar), who perform on parts of the album. 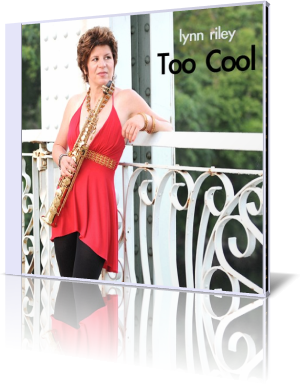 Following the path of Maceo Parker and Candy Dulfer Lynn presents Too Cool, a funky and energetic tune with great verve. One shouldn't underestimate that lady! With Missing You Lynn shows more of her improvisational talent, when she leaves the melody line. Another of Lynn's idols is Grover Washington Jr., to whom she contributes Grover's Groove. The funky attitude is not the typical Grover style, but anyway Lynn manages that tune with grace. On the Caribbean-flavored Island Breeze Lynn changes the instrument and performs the melody on her flute. Lynn's approach to this instrument is absolutely professional. Sedona is a modern combination of grooving rhythm and sultry melody. Crawfish Creole speaks about Lynn's influences from Germantown, Philadelphia to Capetown, South Africa. She is open for all kind of world music. The easy going Tierra Del Sol offers Latin sweets. While Oasis invites to some relaxed recreation. If your are tired of drunken kids being rude to pedestrians and passengers of Metro trains, if you are mourning the time of your youth, when Summerhill experiments were unknown, Tag You're It might be the right upholder. Pamela describes Lynn's imagination of heartfelt romance. Lynn's Riley Too Cool is a debut album with a great emotional impact. The album profits from the rich heritage of Philadelphia without neglecting Lynn's own personality.